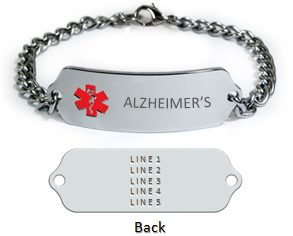 Alzheimer's Medical ID Bracelet, IDB57 (size 1-3/4" x 1/2"), is made from .062" thick premium Stainless Steel, and is hand polished to the mirror finish. It is guaranteed to be rust free for the life. Colored enamel medical Id logo is located on the left hand side of the plate. We have Red, Blue, Pink and Clear colors. On the back we can engrave 5 lines, 20 characters in each line for your personal information.